It’s a rare occasion when an author is able to use a book as a tool to right a historic wrong. 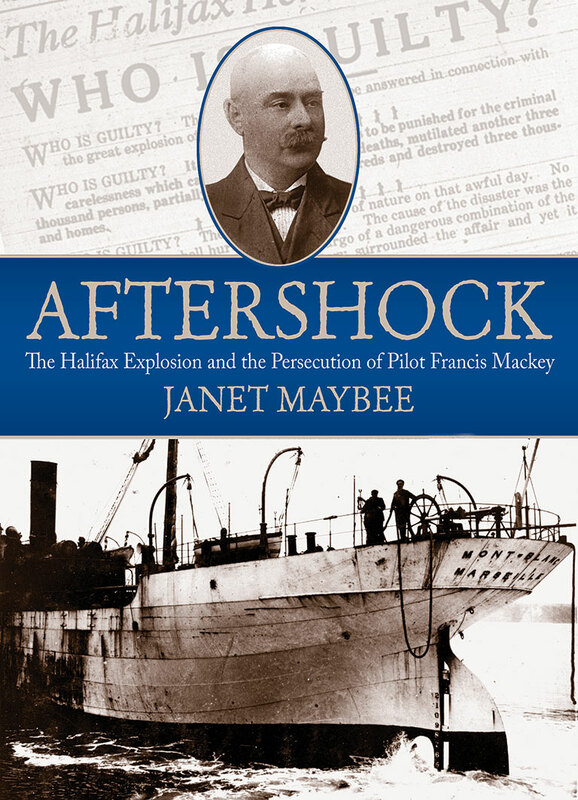 But this is what Janet Maybee has set out to do in her new book, Aftershock: The Halifax Explosion and the Persecution of Pilot Francis Mackey. A research associate at the Museum of the Atlantic in Halifax, Maybee contends that the man who was blamed for the terrible 1917 explosion — which killed and injured thousands and levelled entire swaths of the city — was wrongly persecuted and vilified in the wake of the tragedy. Maybee accuses officials of the day of ignoring and even covering up key facts of the tragic accident, which saw a French munitions ship and a Belgian relief vessel collide in Halifax harbour, resulting in what was, at the time, the largest ever man-made explosion. The author conducted many interviews with the family of Francis Mackey, the harbour pilot blamed for the disaster. She also mined the family’s personal archives for never-before-seen photos that, along with historic images and unique maps, place the Halifax explosion in a very human context. This book is certainly worth reading for anyone interested in a fresh angle on one of Canada’s worst disasters. Book Review: Before there was Bernie Madoff, there was Leo Koretz, a master swindler who, in early twentieth-century Chicago, enticed hundreds of people to invest as much as $30 million dollars — and then simply vanished. Dean Jobb traces the thrilling story of deception, following Koretz from Chicago, to New York, to Nova Scotia, and leads us on a journey through the evasive American dream of easy wealth and its inevitable demise.